It Ain’t a Big Thing, But It Is. In May 584 000 cars and 935 000 light duty vehicles were sold in the United States. Only 1.1 %, or 16,788 to be precise, of these vehicles were electric (EV) or plug-in electric (PEV)s. Not a big number, but in terms of battery storage the numbers get more significant. For the month of May, the total amount of battery storage in the EVs and PEVs cars is 570 MWh. In comparison, according to GTM Research/ESA US Energy Storage Monitor, for all the first quarter this year 234 MWh of stationary “utility scale” electric storage was added and another 13 MWh of distributed storage was installed behind the electric meter. In the last 10 years USA has reduced the carbon dioxide (CO2) by 13 % to the lowest annual level since 1992. During the same time China has become the world’s largest CO2 emitter by far, 28.2% of the global CO2 emissions (2016). 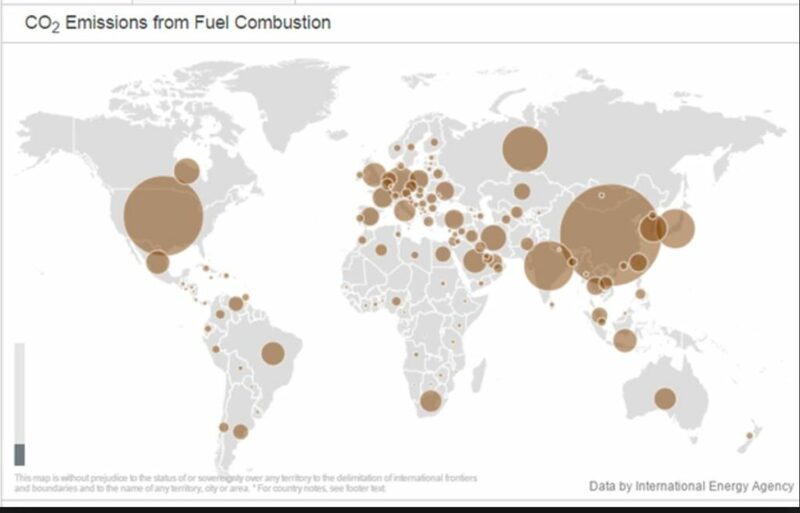 Global CO2 emissions from fossil fuel combustion. 2014. IEA Energy Atlas. In the electric industry, baseload refers to the minimum level demand over 24 hours. The baseload is generally about 30 – 40 % of the peak load. Traditionally the baseload has been served by low cost power generators, operating steadily and continuously. Coal fired power plants, nuclear, and (depending on geography) hydro have been the backbone of baseload generation. Operating in “baseload mode” is more or less a prerequisite for nuclear and coal-fired power plants. That is because of their high fixed costs and need to run due to long start-up times and limited ability for load-following. This paradigm has started to change. EV Fast Charging – Fast Enough? For all car buyers, regardless conventional car or electric car (EV), convenience is a prerequisite. For EVs the charging of the battery is an important part of the convenience. Even though for most the daily use of an EV there is enough electric energy stored in the battery, range has always been an issue. One solution is a series hybrid vehicle (plug-in electric vehicle, PEV) with a small reciprocating engine as an onboard battery charger. For pure EVs (battery only) the solution for range has been to equip the car with a large battery. Tesla has been a leader in this respect. Model S base model has a 60-kWh battery providing 200 miles’ range. There is also a 90 kWh option providing 300 miles. Nevertheless, for long distance driving that range may not be enough. More energy than what can be stored in the battery is needed. Tesla early recognized the importance of developing a proprietary network of fast chargers, called super chargers. Access to their super charger network, which until last year was free, has been a selling point. The power of the super charger has been increased to 145 kW. It can charge a 90-kWh battery to 50 % of its capacity in 20 minutes. Four German automakers, BMW, Mercedes, VW and Audi, in 2016 announced the roll-out of “ultra fast” chargers for EVs in Europe. These chargers will deliver 300 kW of power. At a first glance that high amount of power may give the impression it will provide a very fast charge. However, it is not a given, since lithium ion batteries have limitations how fast they can be charged. In fact, fast charging is more about lithium ion chemistries than the power of the charger. A Creative Approach to Community Energy Storage. Jämtkraft, a municipal electric company in Östersund, Sweden, announced December 13 the launch of a “cloud-based” energy storage for residential customers. For a cost of 20 SEK ($2.50) per month the customer can deposit excess power from its solar installations and use it later. Germany is the 4th largest economy in the world. Consequently, when Germany launched its Energiewende to transform its electric industry from fossil fuels to 80 % renewable by 2050, it got worldwide attention. If such a large economy could make this transformation and stay competitive as a nation, other large economies should also be able to follow. Germany started out with trademark German determination. To make transformation even more aggressive, after the Fukushima nuclear incident, they decided in 2011 to exit all nuclear by 2022. Progress has been impressive. By 2015 renewable energy represented 31 % of all electric energy consumption. If California was a nation, it would be the world’s 6th largest economy. In an executive order, B-30-15, the statewide goal was set to reduce greenhouse gas emissions 40 % below 1990 levels by 2030. As part of this goal California has set the ambitious goal to transform their electric consumption to reach 50% of renewables by 2030. At the end of 2015 renewable energy has reached 26 %. However, contrary to Germany this target does not include large hydro! Trying to compare apples and apples with Germany by including large hydro, California was well over 30 % of all electric consumption from renewables. Germany’s Energiewende Puts On The Brakes. “When you come to a fork in the road, take it!” was Yogi Berra’s way to give directions to his house. In his case he was right, since both roads led to his house. In the case of the German Energiewende it is not as clear what road to take and some roads may not even lead to the destination. Lower Energy Costs Mean Lower Electricity Prices. Right? The U.S. electric industry is undergoing an unprecedented transformation, in terms of magnitude and speed, from a dominance of coal to more natural gas, wind and solar. Natural gas fired combined cycle generation has among the lowest levelized cost of electricity (LCOE). Between 2006 and 2014 natural gas prices fell by 34 %. Meanwhile the average retail electricity price rose by 17%, which is about the same rate as consumer price index during this period. Only one state, Texas, saw a significant decrease, 13 %, in retail electricity prices. It triggers the question: Do lower energy costs also mean lower electricity prices for the consumers? The question is straightforward. The answer is more complicated. It is “Yes and No”. Let’s elaborate by looking at available data for the last 10 years. Plug-In Electric Vehicles Not Ready Yet To Pull The Umbilical Cord of Incentives. In 2015 Tesla sold 25 202 Model S in the USA and an additional 25 164 in the rest of the world. It made Model S the bestselling electric car worldwide and also the number one luxury car in the US. Elon Musk and Tesla have not only put electric cars on the map. They have made it a superior driving experience and a statement for customers to make. Very impressive accomplishments! Nevertheless, as Sonny Wu, a venture capitalist, says: “The guy who’s making the $100 000 (electric) car is not changing the world. The guy who is making the $10 000 electric vehicle is changing the world.” So, is the world changing?